During a protest on 8 December 2014 in the highlands region of Paniai, five West Papuan youth were killed by Indonesian troops and police. Besides, around twenty West Papuans were wounded, and a sixth person died a few days after the act of violence. In consequence of the violent action of the Indonesian Army, the representatives of the Organisasi Papua Merdeka (OPM) and the National Government of the Republic of West Papua (NGRWP) in exile, represented by UNPO, have taken the initiative to organize a demonstration at the Indonesian Embassy in The Hague. 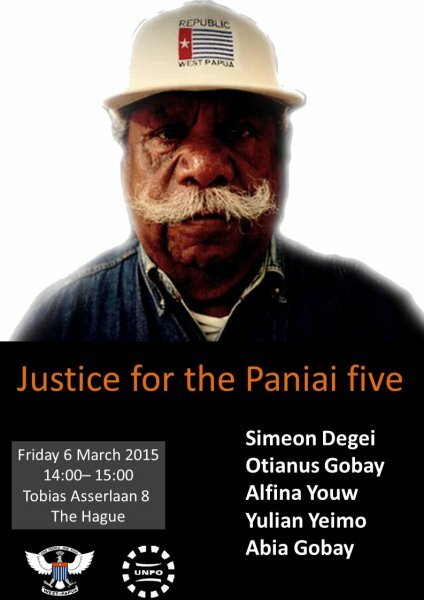 The demonstration will take place on 6 March 2015, from 14:00 until 15:00 at Tobias Asserlaan 8 in The Hague. The purpose of the demonstration is to demonstrate against the action of the Indonesian Army, during which Simon Degei, Alpinus Gobai, Alfina Youw, Yulian Yeimo, and Abia Gobai were killed. During the demonstration, the representatives of OPM and NGRWP will demand for clarifications from the Indonesian representatives at the Indonesian Embassy in The Hague. The situation in West Papua remains critical. There are numerous human rights violations: West Papuans are still being deprived of their lands by the Indonesian government, their houses are being burned, they face difficulties with the maintenance of their cultural identity, and many West Papuans are being killed. Therefore, upon the request of the UN, UNPO submitted a report about the human rights violations of West Papuans to the UNHRC on 16 February 2015. However, the Indonesian government has been preventing reporters and foreign media to fully investigate the human rights violations against the Papuans. Furthermore, there is little sign of progress in the investigations into the violations that occurred in December 2014. For this reason, UNPO is in solidarity with the West Papuan representatives who ask for clarifications from the Indonesian government.